I have been hearing all about how How to Live Well Without Owning a Car is the foremost manual on how to live car-free no matter where you live. I am here to tell you that it is true. This book rocks. It starts by laying out exactly how much car ownership is costing you, and our society as a whole. I found that angle, as opposed to the “Save the Earth” approach, to be oddly refreshing. Let’s be honest, most people care a hell of a lot more about their bank account than their carbon footprint. I sold my car, so I was already rid of that cost, but was still stunned by how much a car is truly costing me. A chapter on how to sell your car also takes the fear out of that, which I can tell you is scary. The book then went on to list all the reasons cars are bad (pollution, road rage, global warming, unwalkability of cities, etc) in a fair and un-tedious way. Again, refreshing and un-preachy. The next few chapters were the most helpful: how to get to work without a car. Balish covered all the bases, talking about biking, transit, carpooling, walking, motorcycling…even in line skating! The advice was simple and well thought out. Real like examples peppered the pages, telling of suburbanites and city dwellers who went car free for a multitude of reasons and have found success. Balish also realizes that not everyone can do such a dramatic thing, so suggests car-lite, an idea that I think most American’s would be more likely to get behind (until they realize how awesome it is and give up their cars completely!). A one week trial period and a weekend dry run are also suggested, making the whole thing less dauting. Wondering how to get groceries, meds, shoes and diapers without a car? All covered in this book that I am now calling my “non-drivers manual”. Tips on arriving fresh and maintaining good hygeine are also a topic of discussion and I found the ideas to be right on track. Dating without a car scare you? Check out chapter 22. This book is a must read for anyone who is car free, thinking of going car free, has a daughter who has recently gone car free (Mom-I am looking at you! ), or thinks anyone who has done it is a freak. The stories are genuine and infectious, the ideas are helpful and realistic and the writing is engaging. I have a feeling I will be referring to this book often in the days to come and loaning it out to friends. (Perhaps we need a copy at Bici Coop?). A quick and helpful read to be sure. 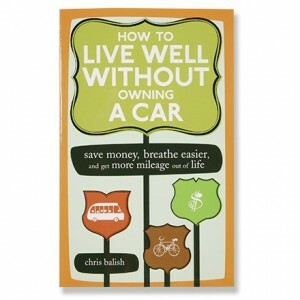 Thanks Chris Balish, you have taken the mystique and fear out of living a car free life in a car centric culture. Glad you [finally] read the book! My wife and I both felt a lot of encouragement out of it and actually use it as a reference every month or two. I enjoyed the book as well, although I had a few gripes with it. Mainly, I thought Balish went to great lengths to detail the many miscellaneous costs of car ownership, but systematically underestimated the costs involved with not owning a car. He underestimates the costs of keeping a bicycle (or fleet of bicycles) well maintained and excludes the many miscellaneous costs of bicycle ownership. So I thought the book was pretty skewed and biased. I happened to agree with his bias, but biased nonetheless. Heh. I think my mother actually cried when I gave up my car, like, years ago. The shame of it… what would her relatives think… It was really a “why couldn’t he have been gay instead” sort of reaction. It really shocked me how hard she took it. It seems to me that Balish accomplishes his car-free life with a lot of help from his car-owning friends and girlfriends. We just got: “Oh. We were hoping to talk you out of that,” from my husband’s folks when we sold the car. Why? WHAT ABOUT THE BABY?! Apparently living without a car, the leading cause of death for American children, endangers our child. Does Balish talk much about family life? Urban bikers’ tricks & tips : low-tech & no-tech ways to find, ride, & keep a bicycle / by Dave Glowacz. Chicago, IL. : Wordspace Press, c1998. iv, 250 p. : col. ill. ; 23 cm. Does he have a chapter on cross-country travel? I love riding my bike around, but when you want to run down to Monterrey or spend a week camping in Yellowstone it’s hard to do on a bike/with public transit. oh what a great post! this is on my to-read list after ‘traffic by michael V.
Meli, the book “Traffic” is by Tom Vanderbilt, not Michael. Braxton-thanks for the encouragement to check this book out. Between you and Ghost, I knew I had to check it out! Reuben-I found that his costs were about accurate for me, but see what you are saying. Good thing he is skewed to the correct side. dukie-my mom actually bought my car from me and was regretting it immediately out of worry and fear. Matt-I hope that I am lucky enough to have friends to help me. and if I ever get a boyfriend with a car…well, that would be ok! ink-I have heard that being car free is a threat to the safety and happiness of infants everywhere! There is a chapter on having a family and being car free. i am sure Braxton is using it a lot these days with the birth of his daughter and being a car lite family. Natalie-there is a bit on long trips, but it is mainly for the everyday life. There are tons of websites on long distance rides. I will try to remember to email you some! Shanyn-glad to know that it has worked out for you. I am already planning to rent a car next month to visit family. Meli-love, love, loved Traffic. Did a review on another site of mine and am planning to move it over here soon. Read Ghosts review…it is really good. Ghost-I love your book reviews. just sayin’. I’ve looked into getting a car, and the expenses associated with it are astronomical, in my opinion. On the other hand, so far I have spent maybe $250 total (including purchasing the bike itself) as a bike commuter, in addition to the negligible amount I spend on public transit monthly (seriously, it’s probably less than your cable bill). I doubt $250 would cover a month of owning a car. I am a IBEW Electrician by trade. This book really helped me get past the jeers of my co-workers, some completely pissed at the idea as if I am some kind of communist ! I doubt there is a profession that presents more obstacles to a car free lifestyle, and in two years I have only missed one day of work to transportation issues! Really ups the curve for good hooky excuses for guys on the job with me!